4. 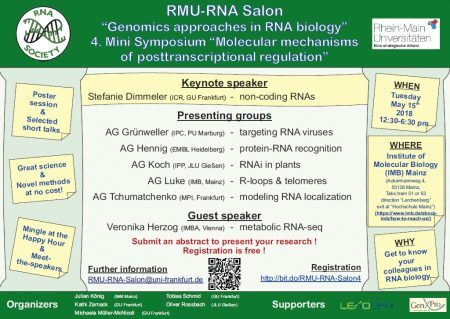 Mini-Symposium “Molecular mechanisms of posttranscriptional regulation” on methods to study processing, structure, and translation of mRNAs as well as non-coding RNAs in disease-related contexts. Regulation der Angiogenese durch lichtinduzierbare AntimiRs. MicroRNA-34a regulates cardiac ageing and function.